Committed to the pursuit of excellence. Every aspect of the workflow is managed on your behalf. From the basic input of raw notes through the engraving process, to the post production audio processing of your music ready for distribution. We offer project management second to none. All of which allows you more time to do the thing you do best... be creative. Any irregularities in the the score are commented upon and suggestions made if necessary and this is exported as a commentable pdf or printed off as a draft copy for posting, ready for your first proofreading. This process of drafts and corrections is continued until you are entirely satisfied with the results and you sign off on the preparation stage ready for casting off. In addition to the commentable pdf, we can also supply low bit-rate audio recordings of the score at each stage of the process in order to assist you in the process of proofing. We call this audio proofing and the results speak for themselves: the ear is very good at picking out anomalies the eye can easily miss. The process of laying out the engraving begins with the error free score with every note at its correct pitch and duration and with all of the dynamic and textual elements in place. A house style is applied that determines the types of fonts, their sizes and positioning, the appearances of notes, clefs and all of the musical elements in the document. 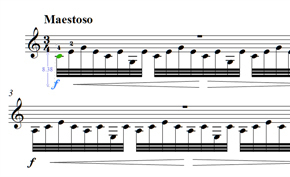 After note input, the optimum number of measures are calculated for each page, and each page considered as part of a spread. Page turns are calculated for the maximum playability by avoiding difficult passages within the music if major rests are not available. Parts are extracted from orchestral scores, cues are added and a different house style is applied. 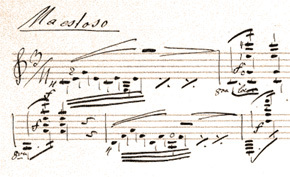 The rules governing the settings of score and parts are different but the typography of the entire work is planned so that retains its sense of being a coherent whole. When the engraving balances the aesthetic qualities of the notation with the practicality of the setting for the performing musician, the readability and playability of the work is enhanced. This increases the pleasure of the participating musicians, and if the musicians are happy, it can only lead to a better performance. 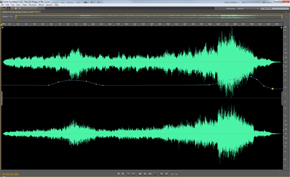 Audio production begins with the source file. Instruments are assigned channels and the properties of each instrument are mixed. Timbre and intonation and the balance of frequencies are finely tuned to give the most realistic sound. When the mix of instruments is complete it enters the final stage where volume is adjusted for optimum playback and the tracks are separated ready for burning to CD. Post production on the score file begins with any design for a cover. This can be as simple as the title and composer printed on the front cover to a fully developed piece of artwork that includes graphics and text set in layers and merged in a final design. The final set of files are burned onto disk with all the necessary fonts and linked files and electronic copies are sent to the printers, ready for printing and binding. All the electronic source files used in your project are packaged separately and dispatched. The electronic copies of all your files are archived on RAID configured hard drives ... along with copies of any software required to read the files as it becomes obsolete. SB Music Engraving offers printing and binding in standard A4 and bifold A4 sizes as well as the traditional Concert (9" x 12"), Folio (8.5" x 13"), Legal (8.5" x 14") and custom sizes up to 13" x 19" for large to very large orchestral scores. Booklets up to 100 pages (9.5" x 13" maximum) may be staple bound, longer spines are punched and bound using a plastic coil. Covers may be in colour or mono on glossy white stock while for large spiral bound scores we recommend pressboard for its durability.